This month is the month of love where Chinese New Year and Valentine's Day coincides is here! Let's welcome the year of earth dog with scrumptious dishes that specially prepare by The Federal Kuala Lumpur culinary team. Celebrate this special occasion by dinning at Bintang Revolving Restaurant. 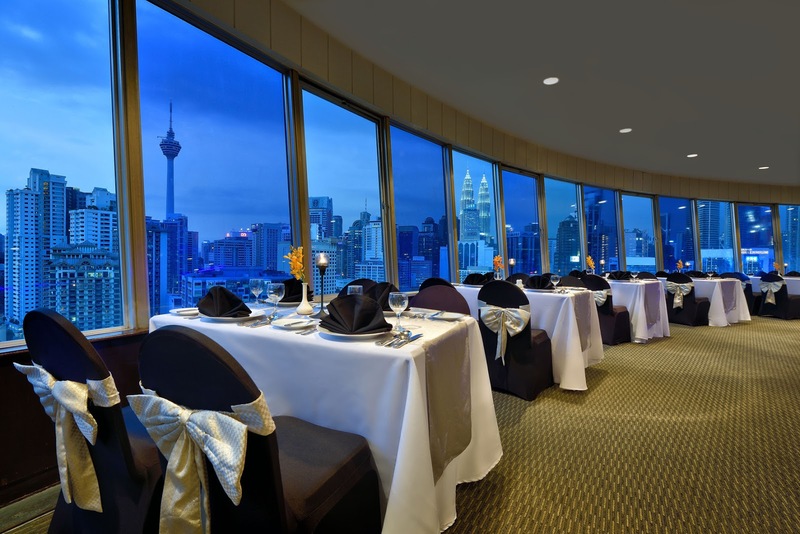 Bintang Revolving is Malaysia's first revolving restaurant and the restaurant is located on 18th Floor of The Federal Kuala Lumpur. Enjoy a romantic dining experience when the restaurant revolves and you get to view the stunning 360 degree panoramic view of the city skyline. To mark this memorable moment, let's celebrate Valentine's Day and Chinese New Year with delectable dishes serve at Bintang Revolving restaurant. Sharing both of the menu in my blog as good thing mean to be shared with everyone, right? 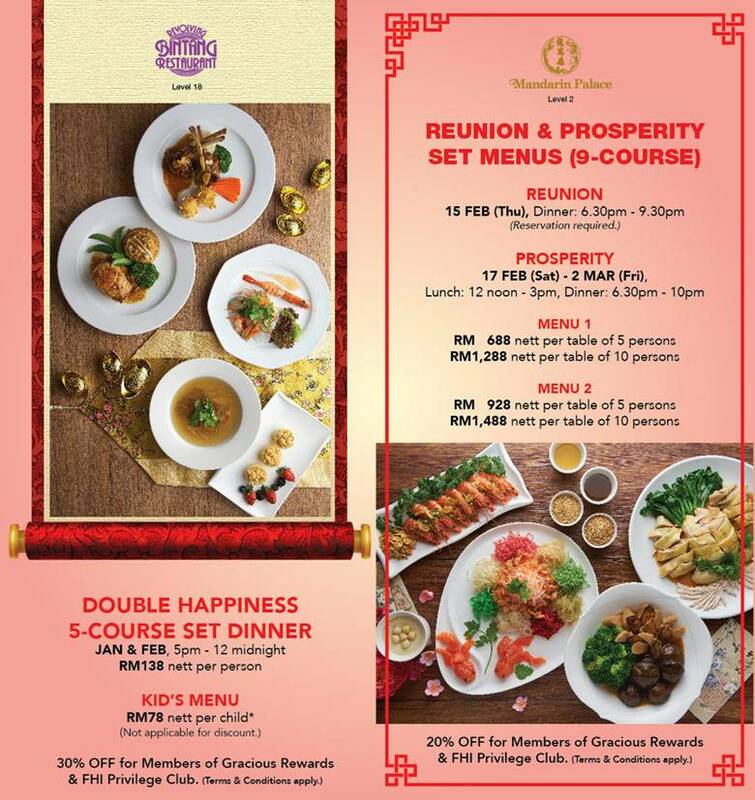 Double Happiness 5 Course Set Dinner is available on January & February 2018 whereby it is priced at RM138 nett per person. While for Kid's Menu is priced at RM78 nett per child. Double Happiness 5 Course Set Dinner will be served from 5pm until 12 midnight. Started our meal with the appetizer, Seafood Glass Noodle with Honey Plum Sauce. A mixture of sourish and spiciness that produce a perfect taste that satisfied your taste bud. Next dish will be Double Boiled Chicken & Lotus Soup with Chinese Herbal. Clear and healthy soup that keep your stomach warm. For the main course, diner get to choose either Grilled Salmon with Honey Light Soya or Oven Baked Rack of Lamb with Garlic Brown Sauce. The salmon is grilled to perfection as you can taste the crispy skin and runny flesh. The fish flakes easily when pierced through with a fork and topped with honey light soya. The dish serve with fresh vegetable and butter rice with mushroom enoki. If you are meaty person, you will love to try Oven baked rack of lamb with garlic brown sauce. Love the play of the flavors to tone down the gaminess of the meat. Served with fresh vegetable and benne potato. Dessert will be Nutella Tartlet with Strawberry. I love the thick and fresh Nutella that filled up the tart and topped with strawberry. There will be a spectacular Lion Dance performance on the First Day of Lunar New Year on 16th February 2018 at 9.30am. The spectacular lion dance will wind its way through the hotel whereby guest get the opportunity to take photos with God of Prosperity. Surprise your love one with the most memorable candle light dinner that accompany with the nice view. 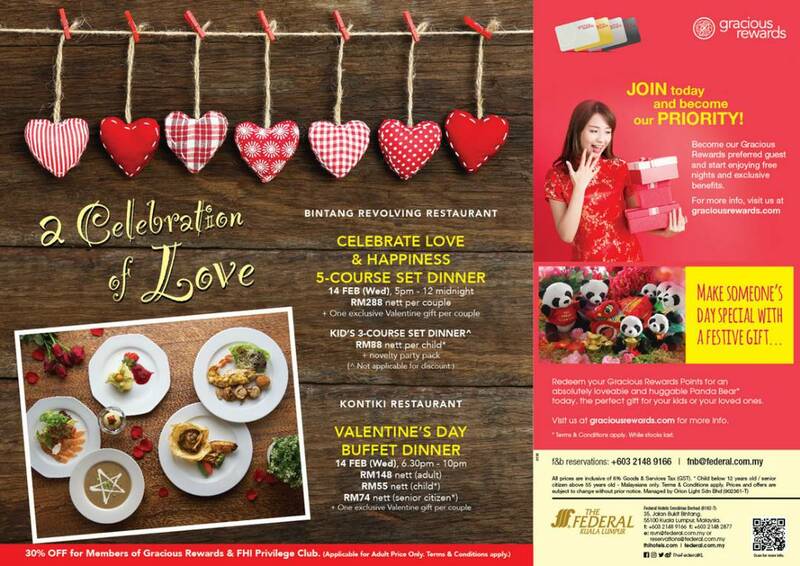 Valentine's Set Dinner is price at RM288 net per couple and is 5 course set dinner. As usual, begin your meal with simple yet delicious appetizer, Adam & Eve Carpaccion De Salmon. The dish serve with green salad and dill yoghurt dressing for the salmon. Savour the creamy and tasty Love Tonic Broccoli & Potato Cream Soup with Roasted Almond. While for the main course, diner can choose either Centre of Attraction Surf N Turf or Baked Tenderloin in Fillo Pastry with Mushroom Stuffing. A unique preparation of Baked Tenderloin in Fillo Pastry with Mushroom Stuffing. You still can enjoy the tenderness of the beef meat although it has been wrapped with pastry. Served with baked potato and broccoli. Another dish that worth to be highlight is Surf N Turf. A combination of lobster Thermidor and grilled chicken breast with wild mushroom sauce. Sink your teeth with special dessert, Passion Fruit Mousse with Berries. Soft and smooth texture of the mouse cake.